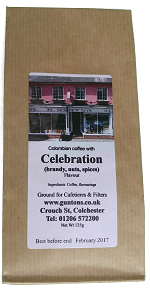 Freshly roasted Colombian coffee with flavours. Ground for use in cafetiere or filter. Christmas LTD Edition: The flavours of Christmas : Jamaican rum, nuts, citrus and spices. Smooth Vanilla: Superb 'French vanilla' taste. Please choose a flavour from the dropdown menu below.